Looking for Name change procedure? Sai Krishna Azad one of the top advocate for the name change. Legal Name Change offers name change, surname change, and other legal services. The Name change procedure is that generally refers to the legal action by an individual of adopting a name different from the name at marriage or birth. We provide perfect Name Change process for those who like to change their name legally and after marriage on social security card legally. We understand the importance of changing the name legally. Our team of name change consultants loaded with full of professionals and hard working people to give a perfect solution for changing your name legally in Hyderabad, Telangana. 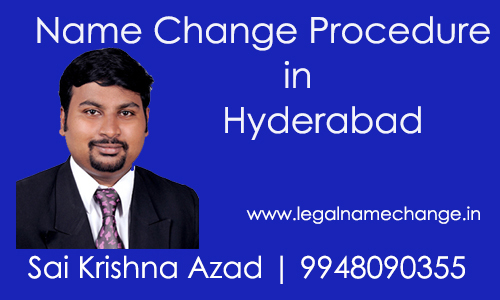 We are the best name change consultants because our team is lead by a top advocate for the name change in Hyderabad by Mr. SAI KRISHNA AZAD High Court Lawyer, a legal practitioner for more than 15+ years at the Hyderabad high court and other various courts in the country of India. We provide services for many legal problems like issues in changing your name legally [Birth Certificate, Educational Certificates, & Marriage Certificates], Divorce, Family and Criminal Cases. We are professional and highly experienced in changing name legally in Hyderabad, Telangana and able to deal all kind of cases. We follow a legal and perfect solution for your name change procedure. Our team has complete knowledge on the changing your name legally in Hyderabad and our law firm is highly famous among the people due to reliable services. We know the quickest way to change your name. Our Legal Name Change process will meet customer requirements. We provide a simple Name Change Certification for clients. If you work as a government employee, we do provide name change for government employees. Our services are available online, just visit our website online and then hire the services within a few clicks of a button. A pseudonym is a name that is changed into a true name. The services can also be done for social, personal and many ideological reasons. We offer the best name change process, listen to our clients what they say about us.